I have a question about three bird's nests in our garden. They where occupied during the summer by the lowly Sparrows, and my question is, do I clean out the summer nests now in the Fall? Or shall I leave them so that the birds have a warm place of refuge during this coming winter? Comments for Bird Nest Maintenance. Hello everyone. We have birdhouses in our open space behind the house, which sparrows and bluebirds return to annually to nest. We do clean them out - apparently if you don't the nests can carry disease for the next batch of babies. However, occasionally have not, either way both species return to the same birdhouses every spring. This year we had a windstorm that took down the bluebird house. I immediately put up a new one, the bluebird tried to take it as his spot however the sparrows chased him out. Now they seem to have taken over all 5 birdhouses. So there you have it, they do return to the same spot, whether or not the previous nesting material is removed. Did you get in touch with Cornell? I sent them an email but they need more info such as..what do your sparrows eat, what kind of sound they make and probably how many nests they made during the year. Anything elese you can think of would be great and perhaps then there will be an answer for your question instead of just speculation on my part. I will follow through with it and remove the nests. Perhaps if I install the nests boxes later in the spring. I will be able to attract a more interesting and colourful species. Cornell birdlabs(urbanbirds@cornell.edu) you can send your question to this link here, they are good about getting back pretty fast. http://www.birds.cornell.edu/ this is their web page adress maybe you can find answers there as well. 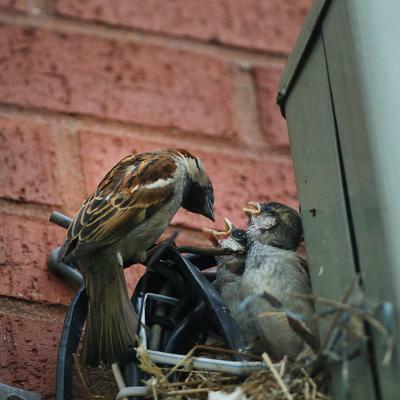 Since they where sparrow nests and it sounds like you are not a fan of them any way take them down, I would. I believe that sparrows choose different places to nest and if they don't I wouldn't want to encourage them to come back. I am not sure if this helps you or not.